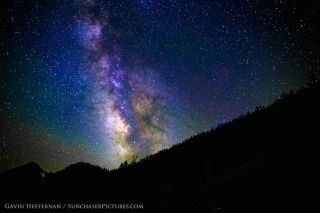 Photographer Gavin Heffernan snapped amazing night-sky photos, like this shot of the Milky Way, in Sequoia and Kings Canyon National Parks in June 2014. California's Sequoia and Kings Canyon National Parks host some of the nation's biggest trees and tallest mountains. But the side-by-side parks in a remote corner of the Golden State also preserve some of the most dramatic views of the night sky. Astrophotographer Gavin Heffernan sent Space.com some spectacular photos and time-lapse videos captured over three days inside the parks, located in the southern Sierra Nevada mountain range. Heffernan said he was able to take some spectacular shots of the Milky Way, star trails and "the biggest meteorite picture I've ever captured" — all against the backdrop of deep marble canyons and the silhouettes of huge trees and mountains. As Heffernan noted, the naturalist John Muir called the majestic landscape around the canyon of the Kings River "a rival to Yosemite," which lies further north. While taking photos in the Sierra Nevada mountains, Gavin Heffernan said he shot "the biggest meteorite picture I've ever captured." Inside Sequoia National Park, the world's largest tree, the General Sherman Tree, which is thought to be more than 2,000 years old, soars 275 feet (83.8 m) above the ground, while Mount Whitney, the tallest mountain in the continental United States, rises 14,491 feet (4,417 meters). Heffernan said he focused on the Mineral King valley and Zumwalt Meadows area of the parks. In another video, Heffernan shows what kind of work it takes to set up a camera to make dramatic time-lapse shots in a forest setting that he says evokes "Return of the Jedi." Heffernan even has a close encounter with a brown bear that stumbled onto his shoot. Sequoia and Kings Canyon National Parks boast some of the tallest trees on the planet — and unspoiled views of the night sky.